Today I come here after long long time. So , this Site's Admin Shafran always told Me , Please , add any Post in My Site. So , Here I came. Anyway , today I'm going to give you very Important thing as a Super Gamer. Today , I'm giving you a Top 15 PC Games of 2013 In The World. I got this all Information from Gameranx Site's Awards 2013. So , I must say Thank U Very Much for Gameranx Site. 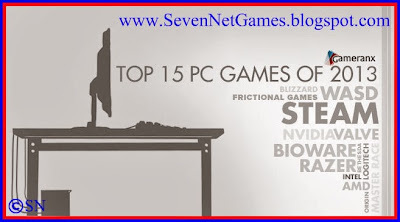 Considerable - These are Torrent Files of these 15 PC Games. * Before You Download These Software , Please Read That Considerable Note In Top Of This Page. 15 ) Starcraft II - Heart Of The Swarm. Starcraft II - Heart of the Swarm is the first expansion pack to Starcraft II, and the second chapter in a planned trilogy of games. The game's campaign takes place after the events of the first game and you take on the role of Sarah Kerrigan and the Zerg race in an all new single-player campaign. Like the first game, you'll decide how to proceed through the campaign by choosing your missions and your army's upgrades which now in the form of Zerg evolutionary enhancements. The multiplayer portion of the game, which is arguably what most people are going to get the game for, is also getting some major additions with new buildings, units, and associated strategies. Many of us may be suffering from MMORPG fatigue, especially with games like The Old Republic and RIFT failing to steal the genre's mantle from World of Warcraft—but that doesn't mean we've given up on MMOs entirely. The publishers of the Elder Scrolls series—which includes Skyrim, Oblivion and Morrowind—have decided to try their hand at the genre with The Elder Scrolls Online, and promise to bring their own brand of gameplay to the genre instead of simply reskinning World of Warcraft as an Elder Scrolls game. Given the caliber of its makers, the game is well worth looking forward to. Arma III is the third game in Bohemia Interactive's series of realistic first person shooters. It's the closest thing you'll get to a lifelike military experience short of washing APCs and shining uniform boots. There's lifesized battlegrounds, one-hit kills, and all sorts of logistical considerations that make the game a seriously enjoyable experience for serious gamers who want more out of their shooters. 12 ) Europa Universalis IV. The war game lives on the PC platform and no other, and the upcoming Europa Universalis is bigger and more expansive than any other wargame before it. The entire duration of the game stretches between the mid-15th century to the late 18th century, containing every detail you ever cared to know about generals, politicians, nobles, and royalty of all the European nations during that time. Like its predecessors, the game is all about politics and war on a grand scale. 11 ) Rise Of The Triad. Rise of the Triad is a modern remake of the classic first person shooter from Apogee Software, whose intro jingle you can surely remember if you're an old school PC gamer. The original RoTT was the first game to see the integration of jump pads—a feature later popularized in Quake 3 and Halo; and a literal 'godmode' that allowed you to banish your enemies with the hand of god. The upcoming game is set to be the very opposite of a Call of Duty game, offering wide open levels, verticality, tons of ludicrous weapons, and violence unlike anything we've seen since Soldier of Fortune 2. 10 ) Amnesia - A Machine For Pigs. If you thought Amnesia: The Dark Descent was a scary game, we're promised something even more terrifying with Amnesia: A Machine for Pigs. It's developed by thechineseroom, which created the haunting (but not actually scary) first person experience, Dear Esther. Nothing pleasant was ever designed for pigs. A reboot of the eponymous 90s classic, Shadow Warrior puts you in the boots of Lo Wang, a "corporate shogun" hired by some mysterious enterprise to locate a mystical katana. The game's penchant for hack and slash, shooting, as well as tactical gameplay will scratch your itch for gory combat versus both demonic and more mundane enemies. The game will see numerous technological advancements and innovations to the RTS genre and best of all, it'll only be available on the PC. Bioshock Infinite takes place not on the underwater city of rapture but on the flying city of Columbia. There's always a lighthouse, and there's always a city. While the original title wowed us with its underwater utopia gone wrong, Infinite takes us to the skies with a colorful and fast paced twist, showing us the utopia's downfall, rather than the aftermath. You'll definitely fall in love with Elizabeth, as you play, but don't get too attached. Wasteland 2 is a tactical turn-based and party-based RPG with an "old school" isometric view in which players take control of a party of up to seven characters (three of which are NPCs), and all of whom are highly customizable. Wasteland 2 comes from the makers of Fallout and the original Wasteland—precursors to just about every other modern RPG. As one of the first major games to be funded by Kickstarter, Wasteland 2's development is entirely independent from the machinations and meddling of marketing departments and corporate big-wigs. Crysis 3 may be getting released on consoles, but it's a game that finds its home on the PC as its developers plan to make full use of the PC's powerful hardware. Veering away from the corridor shooter gameplay of the second Crysis , Crysis 3 is set to offer wide open spaces in a New York City overrun by flora and fauna. Much like the first Crysis and Far Cry before it, players can expect to be able to utilize free-form strategies against AI opponents as they traverse through the wide open areas. 5 ) Metro - Last Light. Metro - Last Light is the sequel to Metro 2033, taking place a year after the events of the first game. Originally slated for release in 2012, the game has since been delayed to an early 2013 release. The writer of the books, Dmitry Glukovsky has been signed on to work with the developers on the game. Like Metro 2033, the game is expected to make full use of the PC's capabilities to offer better visuals than its console counterparts. Planetary Annihilation can be best described as the spiritual successor to Total Annihilation and Supreme Commander, offering real-time strategy battles that take place on a planetary scale. Games are expected to vary from half-hour 2-player battles to large scale, and lengthy 40-player matches. The game is set to feature a planet-based map system spanning over multiple star systems, different types of planets, and even asteroids. Players will be able to conquer planets and even entire solar systems in their war for galactic dominance. 3 ) Total War - Rome II. Total War - Rome II is set to be the latest and greatest title in Creative Assembly's Total War series of real-time strategy games. As the eight standalone title in the series, Rome II is set in the classical antiquity with a focus on the Roman Republic. The game is set to offer a much larger campaign than any previous Total War title, encompassing the extent of the Roman Empire and its environs. This time around however, players will be prompted with a variety of decisions to make throughout their campaign. For the first time ever, players will have to make decisions which affect how the campaign plays out by assigning traits to their legions, customizing their loadouts, and more. Additionally, the game's developers also seek to capture the uniqueness of the different cultures and fighting forces of the time so you won't simply be commanding cloned armies to fight one another. Each unit in the game will have a unique look and feel associated to its culture, and a technological tree that makes historical sense. SimCity is one of our most wanted games of 2013 for the PC. Heck, it's been one of our most wanted games for a decade now. We've wanted a proper, current-generation sequel to SimCity 4, a game which has—thus far—remained uncontested by the likes of too many city simulations that simply fail to compete. The new SimCity offers a city simulation with more detail than ever before thanks to the powerful Glassbox engine it runs on, which simulates everything from underground water tables to the spread of fire, pollution, and crime. Beyond that, it's got detail that'll make use of high-end PC hardware to their max, pushing the boundaries of what's possible in a simulation. It's got its share of problems, but they've been fixed. Aside from the game's always online requirement, most of its issues that were around during its launch have since been alleviated, making it one of the best city simulation games of all time. Battlefield 4 is being developed on a powerful next-gen engine and features Destruction 4.0 - allowing for Battlefield - Bad Company 2 style effects tessellation and dynamic weather effects. As with Battlefield 3, the next entry in the series' primary platform will be PC. More than just a yearly upgrade, the game will come with a host of improvements to the way its maps are set. For instance , each map in the game will be subject to various weather conditions including fog, sandstorms, rain and haze with these being completely random according to the leak. This, and a dedicated single-player campaign will be part and parcel of the next-gen Battlefield 4 experience. So , this is the Top 15 PC Games of 2013 In The World according to Gameranx Site's Awards 2013. Anyway , If you don't play this World's Best PC Games still , Download these & Play just now. OK , leave a Comment about these Top 15 PC Games of 2013 In The World.